Main Page - ModBlackmoon Lettering Art & Design | Main Page. 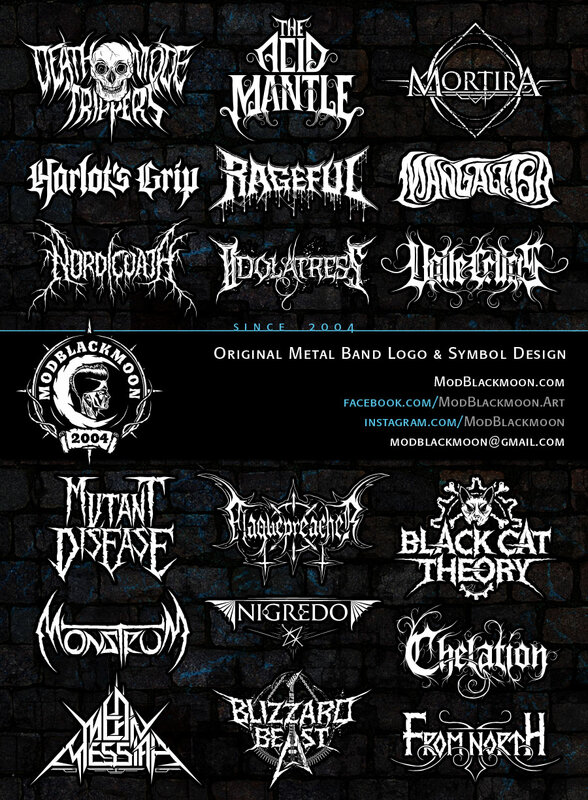 Band Logos Page 1 > Band Logos Page 2 > Logo Request FAQ - Professional Black Metal, Deathcore, Grindcore, Industrial, EBM, Death Metal, Thrash, Metalcore, Gothic, Doom, Heavy Metal band logo and symbol design by request. Personal Name Tattoos and Emblems. Artworks - Available Art and Designs for Black Metal, Death Metal Bands. Graphic Design, Dark Landscapes, Gothic Castles, Skulls, Abandoned Factories, Apocalyptic and Horror Artworks, Album Art for Bands and Books. Fonts Page 1 > Fonts Page 2 > Fonts Page 3 - Free Download of original Gothic, Black Metal, Death Metal, Futuristic, Industrial, Grunge and Horror TTF Fonts for Windows and MacOS. Web-Design Gallery - Dark, Gothic, Fantasy, Futuristic, Apocalyptic and Hi-Tech Web-Design and Game Interface Showroom (No Requests). Previews of unique handmade dark web-template designs. Free HTML+CSS Web-Templates Page 1 > Page 2 - Pre-made custom Free editable HTML+CSS Web-Templates. For both personal and commercial use with no limitations or fees. Workshop - Free Download of Photoshop Resources, Hi-Res Brushes, Textures, Patterns, Styles, Vector Shapes, Templates. Royalty-Free Stock for personal and commercial use. Stock Icons Page 1 > Stock Icons Page 2 > Stock Icons Page 3 - Download High Quality Royalty-Free PNG Icons and Cursors 256px with Transparent Background for Personal and Commercioal use in Web-Design and Interfaces. CursorFX Themes - Download free gothic and fantasy, demonic Cursors for Stardock CursorFX and CursorXP for Windows. Icons - Desktop Icons and dark gothic and futuristic Icon Sets for Stardock IconPackager, separate ICO and PNG Icons. Wallpapers - FullHD Abstract, Dark and Landscape Desktop Wallpapers. Metal Fan Wallpapers - Black and Death Metal Music Fan Wallpapers (no longer updated from 2010). About Me - Who I Am | ModBlackmoon Bio.